The National Space Centre in Leicester is somewhere I have driven past signs for on the M1 and always wanted to visit. Thankfully, on our way back from London, we stayed at my aunt's house in Leicester and made the most of being in the area by visiting the National Space Centre.It is a National Lottery funded day out and is also the UK's largest attraction dedicated to space exploration. We visited with our children, our daughter who is six and my son who is eight. I think they were a wonderful age for the Space Centre, but there were also many younger and older children there too. Although it's not a particularly large museum, they have an incredible amount there and it takes a long time to get around every display. We spent four hours there, but could easily have been there longer. 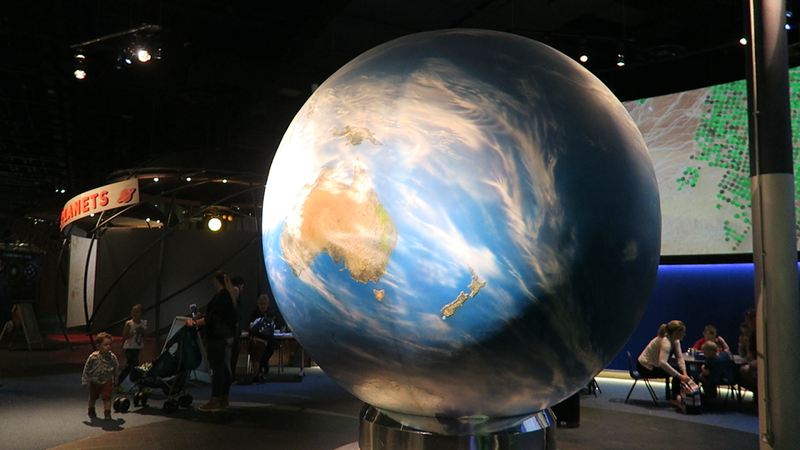 A huge amount of the exhibits are hands on or encourage participation. Tranquility Base has a simulator which is good fun and you can even take record your own weather report too. Whilst we were visiting there were plenty of additional activities for children, including crafts and some hands on science. I loved how interactive the museum was. There were no 'boring' exhibits and the children (and us adults too) were entertained throughout our visit. Included in the ticket (or £3 per person if returning on an Annual Pass) is a show in the full dome Sir Patrick Moore Planetarium. We saw the award winning show 'We Are Stars' and my mind was totally blown. I genuinely had a tear in my eye during the show. It really was amazing and made me feel incredibly minuscule. The show was probably not suitable for younger children (under 2 at least) as there are moments of complete darkness, and the movement of the show on the dome can make you feel a little seasick. 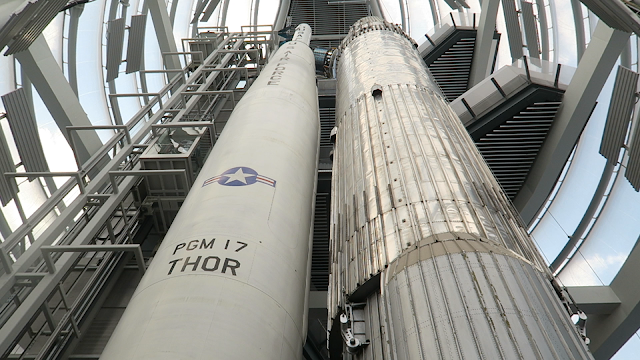 The National Space Centre houses both the Blue Streak and Thor Able Rockets. I loved that there was a simulation take-off in the cafe, so children were crowding around it and it entertained them whilst they were having their lunch. 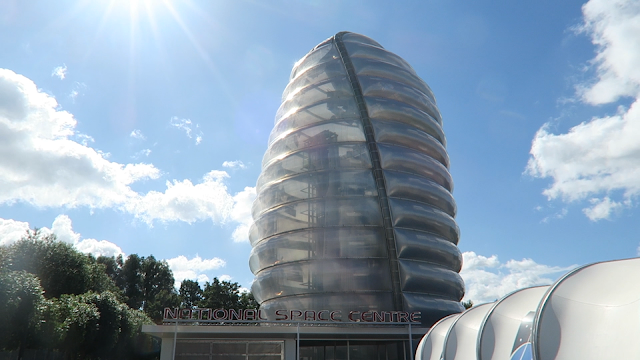 The building of the National Space Centre was funded by the National Lottery, which continues to raise £30 million every week for good causes across the UK. The facility is also a centre for learning, providing education programmes that aim to increase the science literacy of children and the general public. There are various trails which you can go on, including a 'look up' one at the many satellites hanging in the space of the galleries. Our children both had passports, which they needed to get stamps to get a prize at the end of their trip. In order to get stamps, they had to ask the staff members who had badges with a specific name on (such as Satellites or Night Sky) a specific question. I thought that it was a really good way of encouraging the children to ask questions and to find out about space. In fact, I learned a lot of fun facts from this. Exploring the universe sounds like it might take some doing, but my daughter spent an awful lot of time searching through the stars and planets. We had an absolutely fantastic day at the National Space Centre and will definitely return to visit again in the future. I would highly recommend it for all ages of children. I filmed a vlog of our day out, so check it out below. Disclosure: We were provided with tickets for the attraction for the purpose of this review. This had no impact on my post, which is honest and fair.